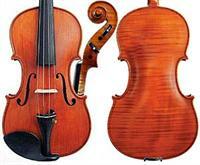 Hunter Violins are proud to offer a varied collection of stringed instruments for sale and rental. We try to cater for all budgets and skill levels from student model instruments up to fine antique violins, violas and cellos. Some of the brands we like to sell include Gliga, Enrico, KG, Jean-Baptist Collin-Mezzin, Herman Dolling JR, H. Dennis and many others. Please give us a call if you would like to discuss an instrument to suit your needs. Phone 02 4927 0700. 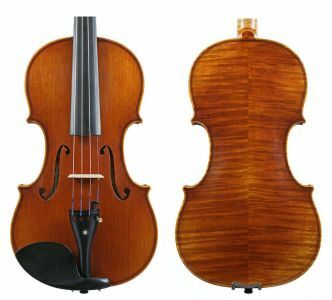 Compared with other cheaper brands, Enrico Student Extra violin sounds much deeper, smoother, and has enough projection to satisfy a beginner player up to the intermediate level. KG instruments are handcrafted in Beijing, China using fine maple and spruce. These violins are set up to professional playing standards which includes a fully hand carved bridge and fitted soundpost with fitted pegs for easy tuning. The fingerboards are planed to meet the correct curves and profiles for ease of playing. Ideal for intermediate level violinists, these violins have a clear, balanced tone and a quick response. Gliga violins are handcrafted in workshops directly supervised by Mr Vasile Gliga. Highly flamed and naturally aged sycamore maple employed for back, neck and ribs. Close grained Carpatian resonance spruce top. The outline of the instrument's body is deepened and the plates are precisely graduated. Special attention has been given to the deeply etched and well highlighted scroll. A greater number of coats of varnish are applied. Charles Jean Baptiste Collin-Mezin (1841–1923) was a distinguished French maker of violins, violas, cellos, basses and bows. He was an Officier de l'Académie des Beaux-Arts and won gold and silver medals at the Paris Exhibitions in 1878, 1889, and 1900. 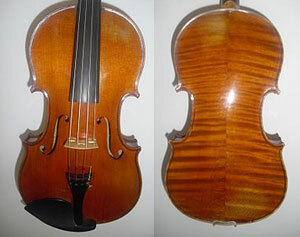 Like the best French luthiers, Collin-Mezzin's designs followed in the tradition of the famous Italian schools Stradivarius, Guarnerius, and Amati, although he developed his own unique varnish. 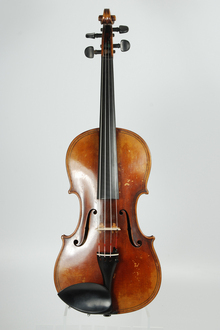 An antique violin by Hermann Dölling Junior (1862 - 1923). German maker of fine violins.